An Americana Hymnal For The Doomsday Cult Of 'Far Cry 5' Composer Dan Romer has created soundtracks for award-winning films. His latest project is creating hours of music for a video game which follows a sheriff's deputy into a religious cult in Montana. 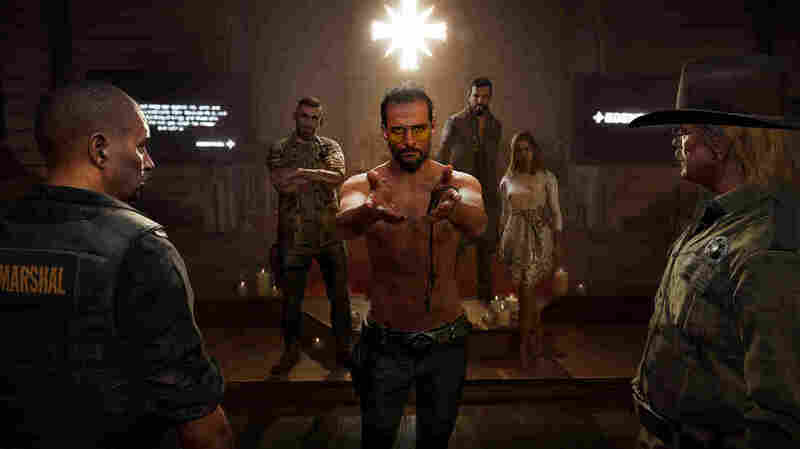 A still from Far Cry 5 shows the fictional apocalyptic cult that the video game follows. Award-winning composer Dan Romer is best known for scoring TV shows and films like Beasts Of The Southern Wild and Beasts Of No Nation. Recently, his career took a turn from movies to video games. He's written the music for the latest installment in the popular series Far Cry. Far Cry 5 is a first-person shooter game, set in rural Montana. You're a sheriff's deputy, out to get the leader of a murderous doomsday cult. As you move through the game, the cult's hymns play through loudspeakers and car radios. In total, Romer wrote almost five hours of music for this game. 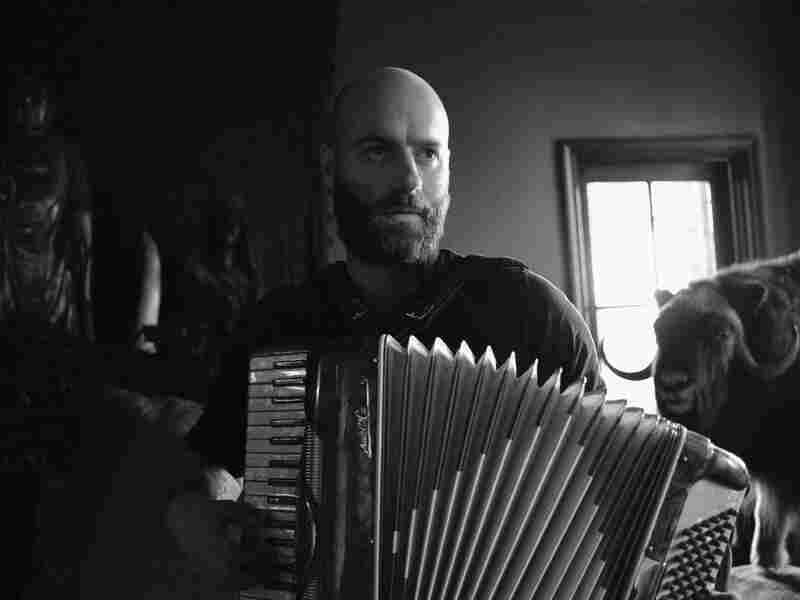 "It's all kind of centered around Americana music," he says, "... like, banjos, mandolins, fiddles, accordions, those kind of American folk instruments, but then supported by super-aggressive electronic and organic percussion." So the game revolves around a fictional cult, and they gave me a copy of the cult's bible. They wrote a bible for the cult — yeah. And they gave it to me, and they're like, "Absorb this. We want 10 songs that they would sing as their hymns." So these are songs that are used for two things by the cult. They're for brainwashing purposes and recruitment purposes. And so I was trying to write songs that would make you want to join this cult, not saying they would be like, "This cult is so evil, we're so bad." These are meant to be real-world, like, "Hey, check out how great it is over here. We all love each other. The rest of the world is so horrible," you know? One of the most harrowing and poetic things in their bible was the idea of "The Great Collapse." And I have a song that I wrote about that. It's called "We Will Rise Again." I mean, I wanted to make songs that make you want to join this cult and make you want to have this family. I wanted to make these songs relatable, and I wanted to make this cult feel realistic. If all the songs were like, "We're a cult and we do terrible things to people," then I'm not joining this cult. That's crazy. But if they're like, you know, if they're singing about love and family, I mean you're like, "This sounds great. The world has gotten so strange." Dan Romer has created award-winning soundtracks for films like Beasts Of The Southern Wild and Beasts Of No Nation. Not really, because it's loop-based, so you know, the decisions are kind of like, "Well, if this happens, this loop happens. If this loop happens, this loop happens." The difficulties are different difficulties than scoring a film. I mean, you're sort of freed when you're scoring a video game by the fact that you don't have to adhere to exact moments. And it's nice to be able to have that freedom of when you're making a big combat loop, you're like, "There can be anything that happens as long as it just stays super aggressive." I mean, there's tons of film composers going into video game composing at this point for sure. Video games are getting more and more like movies. TV shows are getting more and more like movies, you know? I mean, we're demanding as we go, a higher caliber of storytelling and a higher caliber of production. And so, who knows how long we go before there's no real difference between those three things. Kat Lonsdorf and Jessica Deahl produced and edited this interview for broadcast. Sydnee Monday and Patrick Jarenwattananon adapted it for the Web.